Most knitters know that once you pick up the hobby it’s like a flashback to the classic Star Trek episode “The Trouble with Tribbles”. You bring just one harmless ball of wool into your house and before you know it you’re swimming in sock yarn, pushing past the worsted weight just to open the refrigerator door. We have a solution for you: Knitting Book Clubs. The Winnipeg Public Library is now hosting two(!) Knitting Book Clubs starting in October. This is the perfect opportunity to grab a knitting pattern book from your local branch, or download one in ebook form from Freading or Overdrive, and start transforming those ever-multiplying piles of fibre into something both beautiful and useful. Baby shower approaching? Baby blankets are notorious for their ability to swallow up surprisingly large amounts of yarn. Maybe your issue is with single skeins or the remnants from other projects? Toys, mittens, and those teeny tiny adorable socks are perfect projects to use up leftovers while thriftily acquiring a heartfelt and handmade gift. No babies in the immediate future? No problem! There are a plethora of titles in the library that are eagerly waiting for you to take them home and knit away your tribbles – or, troubles. And I do mean that quite literally. If you’re anything like me, once you start knitting there’s no end in sight. One project begets another and the “just one more row”s, “I just need to finish this section”s, and “I’m trying to pay attention to this pattern, I’ll eat dinner later”s become a regular chorus in your household. If so, I can tell you there is a method to the knitting madness. Just do a quick search online for ‘knitting’ and ‘health benefits’ and you’ll find article after article listing the advantages of crafting and, specifically, knitting. Many of these cite the Mayo Clinic study where seniors who engaged in cognitive activities, such as knitting and crocheting, had decreased odds of having mild cognitive impairment. These activities even served as a buffer against the development of dementia and Alzheimer’s disease. Crafting is unique in this way because it involves multiple areas of the brain at once: creativity, visuospatial processing, problem solving, memory, and attention to detail. But the benefits do not end there. Knitting has been lauded as the ‘new yoga’ and there’s a certain amount of truth to it. Crafts such as knitting can have profound meditative effects. A CNN article from earlier this year cited psychologist Mihaly Csikszentmihalyi’s flow phenomenon – those moments where you become so completely absorbed by an activity that everything else falls away. Many knitters cite the hobby as an excellent way to numb pain, relieve anxiety, and cope with depression, among many other disorders. Fort Garry Library’s Knit Lit runs the third Tuesday of the month starting Tuesday, October 21st at 6:30 pm. Call 204-986-4918 to register. Louis Riel Library’s Knit Night runs the first Thursday of each month starting October 2nd at 6:30 pm. Call 204-986-4573 to register. Battle the Boredom Bug this Summer! Cue the library. This summer, we’ve got fun on lockdown. And when it comes to teens, we’ve got more than enough to keep them busy — no matter kind of teen you’ve got on your hands. This year, we’ve taken our Teen Summer Reading Club online, which means that our club is in session 24/7, all summer long. To sign up for the club, just visit wpl-teens.winnipeg.ca, and tell your teen to register using their email address. They’ll receive a weekly e-newsletter featuring quizzes, book picks, teen event listings and more. We’re giving away great prize packs every week! Teens can also enter our online summer contests by sending us their best photos/artwork, top ten must reads, short stories/poems, and book reviews – all of which will be posted on our website! The best of the best in each category will also win a great prize. For the social butterfly, we also have a few Teen Book Clubs that meet all year round to discuss some of the library’s hottest reads. What a great way to make new friends, and discover some fabulous new books! If you’ve got a perennial go getter on your hands, why not encourage them to do a little volunteering?! At the library, we’re always looking for teen volunteers – and summer is the perfect time of year to cram a bit of experience onto that resume. This summer, we’re looking for teen volunteers to help out with Family Literacy Fun Days. Volunteers will assist families with young children at activity stations, doing things like playing reading games and making simple book crafts. So much fun! (Call 311 for more details). We’re also looking to recruit a few new members to our library’s Youth Advisory Councils. As YAC members, teens do things like plan and run teen programs, read and review books for the library’s newsletter, write blog posts for the library’s teen website, and provide feedback on design decisions for the library’s teen areas. At the library, crafty is our middle name. And if your teen has even a hint of Martha Stewart underneath that backwards ball cap, you’ll want to tell them about our craft workshops. 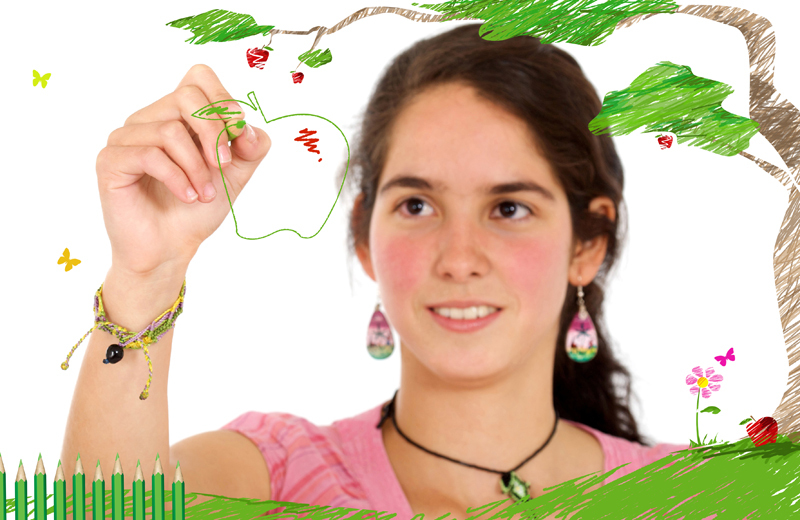 We’ll have them doing everything from making their own jewelry to sewing a mini felt mascot. All free of charge! So before the thought even comes to mind, battle the boredom bug this summer, and encourage your teen to participate in a few of the library’s many programs! There’s bound to be something of interest for your teen! Last year, Bloomberg Business Week printed a story about a man who began having rather apocalyptic nightmares after his son was born. He envisioned the bookshelves in his compact Japanese home falling on his new baby, burying the child in books. So he did what any prudent parent would do: he bought a scanner and converted his 850 books into PDF files. Now, you may be gripped by New Year’s resolution-induced clean-ups, or perhaps you are still enamoured with your new e-reader. But if you find yourself with extra books on your hands—the old-fashioned kind, with pages and covers—there are a few ideas for what to do with them. 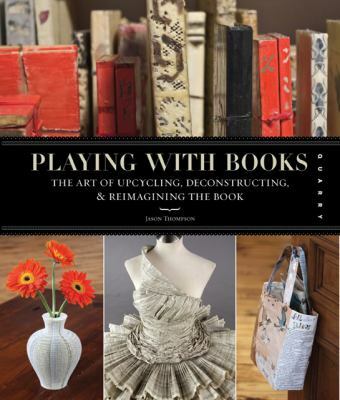 Playing with Books: The Art of Upcycling, Deconstructing, and Reimagining the Book by Jason Thompson edges from craft into art with a similar approach to the same medium. The gallery section of the book highlights some beautiful works, incl uding that featured on the book’s cover: a dress made of telephone book pages. One artist frequently highlighted in exhibits or publications dealing in book art is UK artist Su Blackwell, whose detailed artworks are fascinating in their meticulous detail. Her gallery shows intricately-cut book pages assembled as sculptures. Perhaps the most clever ones use books as both subject and medium, such as those featuring scenes from Wuthering Heights or Alice in Wonderland. Another artist highly accomplished in the realm of paper art is based in Scotland, but remains anonymous. In spring 2011, a librarian discovered a small, detailed paper sculpture of a bird’s nest and eggs. It was accompanied by a note, saying”This is for you in support of libraries, books, words, ideas…” By November, a total of ten such sculptures had turned up at libraries and museums in Scotland. The final note said that the sculptures were thank yous for the kind of “special places” where they had been left. If perhaps you are not ready to part with your books in such a permanent way, two older books highlight some storage choices. Living with Books by Alan Powers has a range of appealing ideas, including the highly impractical (and dangerous) stacking of books along the edge of a stairca se. It also includes a whimsical “coffee table book table”, comprised of glass sandwiched between–yes, coffee table books. 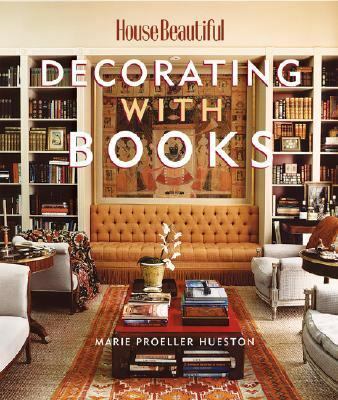 While more traditional in its approach, House Beautiful: Decorating with Books by Marie Proeller Hueston does feature a dramatic, three-foot pile perilously wedged across the full expanse of a mantelpiece. Books Make a Home: Elegant Ideas for Storing and Displaying Books by Damian Thompson can provide some further storage ideas. Whatever style of home you prefer, books can add something to your interior, whether they are the honey-coloured leather covers lining your Italian villa, or the identically slipcovered tomes in a modernist condo. (Does anyone except designers actually do this?) In a great variation of the recliner with pockets for the remotes, this book features the Biliochaise, where you can surround yourself with five linear metres of your favourite reading material. In the end, there is a solution for the Japanese man who consolidated his collection but might miss the ambience his books provided. A designer has come up with wallpaper printed to look like an array of bookshelves. But given the design’s sagging shelves, homeowners may never be free of their nightmares about collapse!